Use the appropriate calculation tool below depending on the type of application to determine how many bags of thermal insulating cellulose you will need to perform your insulation work. 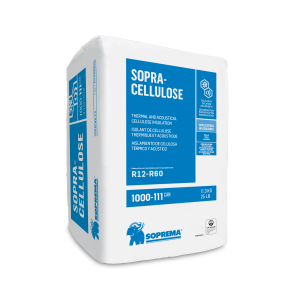 Click here to refer back to the SOPRA-CELLULOSE thermal and acoustical blown cellulose insulation coverage chart. The quantities indicated by the calculator are given for information purposes only. SOPREMA Inc. is not responsible for the quantities displayed by the calculator and will not accept any liability whatsoever resulting from the use of the calculator, including the surface to be covered. In addition, SOPREMA Inc. will not be held liable for the lack or surplus of material determined for the surface to be covered, whether or not the calculator has been used. Please note that the results are calculated by taking into account an overall loss rate of 10%, more or less. If you have any questions, please contact your representative.